The most important festival at the Dwarkadhish Temple is Janamashtami, the day of Lord Krishna’s birth. Like in Mathura where he was born, this is a day and night celebration with the rituals reaching a crescendo at midnight, the time of his birth. The temple also has a daily schedule of pujas, aarti and darshan when devotees can watch the rituals in the garbha griha. 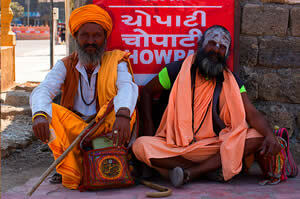 The religious rituals of the temple were established by the Vaishanava saints Ramanujacharya and Madhavacharya. 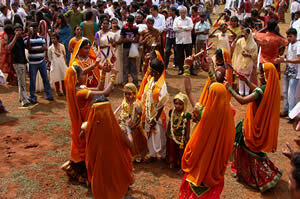 So the temple follows the ritual guidelines of the Pushti Marga system of worship. There are daily aartis with the playing of drums, cymbals and bells as people sing out the lord’s praises. 8 am – 9 am Abhishek Puja (snan vidhi).Darshan closed. 9.30 am – 9.45 am Snana Bhog.Darshan closed. 10.15 am -10.30 am Shringar Bhog.Darshan closed. 11.05 am – 11.20 am Gwal Bhog. Darshan closed. 12.00 noon – 12.20 pm Rajbhog.Darshan closed. Lord Krishna is worshipped with a joyous adoration by his devotees as people sing and dance to their beloved god. This worship called bhakti leads to colourful festivals full of the singing of bhajans composed in his praise by poets like Mirabai, Surdas and the Alwar saints of the South. The most important celebration at the Dwarkadhish Temple is during Janmashtami that celebrates the birth of Krishna at Mathura. Lord Krishna was born on the ashtami, the eighth day of the Hindu month of Bhadra. At the Dwarkadhish Temple the celebrations begin in the morning and go on past midnight. Among the highlights are the Abhishekh Snana when the image is bathed in holy panchamrit made of milk, honey, ghee, curd and sugar and then in water. On this day devotees are allowed to view the ceremony. In the shringar the image is adorned with golden pitambar silk garments and ornaments made of gold set with diamonds and other precious stones. The aartis are much more elaborate with the playing of drums and the offering of incense, flowers and a lamp with 108 flames. The temple echoes to the singing of bhajans and at midnight, the time when Krishna was born there is a joyous chanting of mantras. Next morning an image of the child Krishna is placed in a cradle. The temple also has a flag ceremony. The 52 yard long flag flying over the sanctum is changed thrice every day. During this ceremony devotees pay for the honour of carrying the flag on their heads around the temple before it is flown from the shikhara. There is the chanting of shlokas and a puja. The flag is made using silk in seven colours of red, green, yellow, blue, white, saffron and pink. Priests climb to the top of the shikhara and change the flag and break a coconut there.